Kenneth Irungu, second year iServe Africa apprentice who blogs excellent stuff at Gospel Insights, reviews David Helm’s 9Marks book Expositional Preaching. In a generation of prosperity preachers who use the Bible, as Helm would put it, the way a drunkard uses a lamp post, more for support than for illumination, Expositional Preaching: How We Speak God’s Word Today is of much relevance. We greatly need such a book that exhorts every preacher, the beginners and the experienced, to bring out of Scripture what is there and not to thrust in what they think might be there. The book has four chapters, with a well-crafted introductory chapter introducing Charles Simeon, a man who returned the Bible to the center of church life in England, and a conclusion chapter calling upon every preacher to hope that some good will be done by their preaching . The first chapter of the book points out three common mistakes we make as a result of our attempts to contextualize biblical texts. It shows how we preach without doing an exegesis of the text (paying attention to biblical text’s original audience and its purposes) or having any theological reflection on the text (seeing how a bible passage relates to the saving acts of God in Jesus). The other three chapters highlights approaches for preparing sermons that enable preachers to join Charles Simeon and other solid expository preachers in the faithful and fruitful work of biblical exposition. These steps include doing a biblical exegesis on the text, having a theological reflection of the text and then applying God’s word to today. Helm argues that leaving a sermon at exegetical step makes it purely intellectual and imperative. He also notes that preaching a sermon after theological reflection without applying it to today ends up having spiritualized and dehistoricized preaching. The author notes that prayer is key in expositional preaching. He urges preachers to pray in advance of preaching, in the act of preaching and after preaching is done. He calls us to be ever desperate for the power of Holy Spirit to attend our preaching for the power does not rest on us. Helm concludes the book by warning every preacher from looking for more creative and artistic ways to make the sermon relevant. He calls the readers to see preaching as a duty bound to the text. He adds that the preacher should keep the eyes open and face planted in the text to be able to articulate the theme of the text and the aim of the author. He also gives an appendix of helpful questions that every preacher should ask during sermon preparation. Another nice feature of the book is the line drawings throughout. These make it easier for the reader to understand the key points. He also uses his example and pitfalls to help the reader learn from his mistakes. Helm does so well in connecting one chapter to the other, with each new chapter having a recap of what has been learnt so far. He also repeats the key points to note as he concludes every chapter. I highly recommend the book to young preachers, like myself, who are trying their teeth in preaching. It is a relevant book too to experienced preachers who want to remain faithful in their work. It is unfortunate that I can only say this little about this impacting book that should be on the shelf of every Bible preaching preacher. AH: I agree with Ken and very much appreciate this book. Just one concern would be that it is very much from and to an American/European context so some of the language and a number of the illustrations sound very strange reading it in an African context. E.g. “Contextualization is a good dance partner, but she should never be allowed to lead… It’s like we want to spin her out away from us in exciting circles, showing off her long legs and high heels.” (p.40-41) As I said to Ken, we desperately need someone to write an African book on preaching Christ faithfully from the Scriptures. Ratio of amount of Bible read to length of sermon. Paul calls Timothy first to devote himself to the public reading of Scripture. In the 1662 BCP service of Morning Prayer as originally conceived, there would have been 7 or 8 chapters of Scripture read in the course of the service (including set Psalms and Scripture in the liturgy). That would be at least 30 minutes every Sunday (and possibly more with total Scripture length sometimes over 4000 words). In contrast the average length of the Homilies prescribed by Cranmer is around 3200 words (though some in the later second book of Homilies are considerably longer). Again, around 30 minutes. Compare that ratio of 1:1 with our more normal modern practice of a short reading immediately before the sermon. Placement of prayer. Is it before the reading or between the reading and the sermon? If I pray for our hearing of the Word before it is read then that implies that it will be speaking even as it is read. If I always pray immediately before the sermon then the implication could be that we’re only going to hear God really speak when I unpack what would otherwise be rather unclear and hard to understand. Ratio of introduction to body of sermon. How long does it take me to get into the passage itself? Introductions can be helpful in many ways but when it gets over a certain length then questions may be asked about whether I am really confident that the Bible is a) clear and b) gripping. Speed and expressiveness in reading the Scriptures versus speed and expressiveness in the delivery of my words in the sermon. For one thing we need to make sure that whoever is reading the Scriptures in the public gathering does it really really well. But even in the sermon itself there is a danger – that when I as the preacher refer back to a verse or quote Scripture in the body of my sermon, I read it very quickly, rushing through it as a footnote or a parenthesis, while in contrast, when it comes to my own words and phrases and headings and points, I go more slowly, with much more emphasis. What I am subliminally communicating is that the Scriptures are my launchpad – and a rather dry and dusty one at that – while the thing you really need to take away is my carefully crafted rhetoric or 3 points beginning with P. What if I reversed (or at least equalised) the equation and gave great attention to how I read the Scriptures – with real force and authority and expressiveness – stressing the key words that make the point? What if I aimed to have the congregation go away with God’s words ringing in their ears not mine? Number of cross-references, particularly corroborative and thematic. There is a place for cross-references, particularly Biblical theological ones connecting a passage into the big salvation story of Scripture, but generally, once the number goes beyond two or three cross-references there is an inverse relationship between number of references and our focus on and confidence in the text in hand. Particularly troublesome are the ‘this makes me think of…’ type of cross-reference or the ‘as it also says in…’ type. In contrast, a tight focus on one text communicates that there is plenty here; each passage of Scripture is clear and rich and solid. Relying on God’s words to do the cutting versus relying on additional illustration or application to do the cutting. It’s important to illustrate and apply God’s Word. It’s important that things are grounded in real life. But there is a danger that, as one brother put it, “we use the illustration to do the work and make the turn.” In other words the thing that brings the energy or twist or punch in the sermon is my story that I have made up or my clever incisive application. It’s a form of preaching that people love but the warning sign is when you get feedback like “That was so powerful. I would never have got that.” or “It was so clever what you did with that passage. You made it so relevant.” Another warning sign is it people are nodding off as you go through the text but then sit up for the second half of the sermon when it gets to ‘application time’. Let’s labour to preach God’s Word with the clarity and relevance that it innately has, but let’s make sure that it is the Word that is cutting to the heart and not my elaborate application bolted on the end. Let application be flowing throughout, straight from the text itself. Physical distance from the Bible. This is perhaps the easiest one for the observer to spot because you can literally measure it with a tape measure. I remember watching Dale Ralph Davis preach and his head never moved more the 30 centimetres from the Bible (which was incidentally his Hebrew Bible) as he passionately wrestled with and preached the Scriptures to us. I can remember another time with another preacher when the Bible was left on the pulpit as the preacher moved further and further away, and the further he moved physically, the further he moved in terms of content, until he was spouting complete nonsense. Certainly there’s nothing magical about the Bible and being close to it but if you want to ‘reason from the Scriptures’ (Acts 17:2) and if you want to show that your authority is the Word and you have nothing to say apart from this book, then it would make sense to stay glued to it. 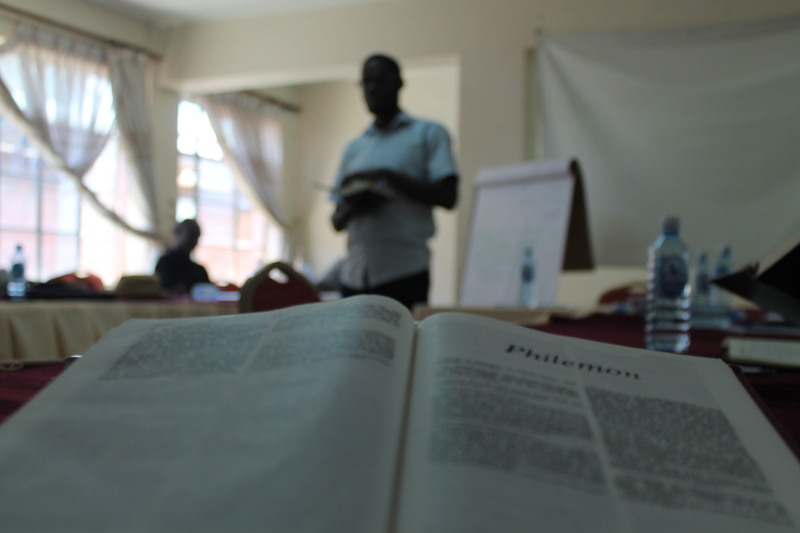 Thanking God for the East Africa Bible Expositors’ Fellowship last week in Kisumu. Great joy and encouragement to meet with brothers from 6 nations, learning from Titus together, talking honestly, finding out about what God is doing through some great ministries across this region. It is good to stare in the face the ‘brutal facts’ in our E African context that challenge faithful Bible teaching and the practice of hard lengthy labour on the text: 1) The attitude “I know the passage already”; 2) Congregations that are easily impressed, so I can get away with cutting corners; 3) Wanting to be popular / wanting to hold onto people who are deserting to the prosperity / hyper-pentecostal churches so I am tempted to copy what they are doing; 4) Wanting quick easy fixes; 5) Hobby-horses and the temptation of sermon recycling; 6) Taking too many preaching invitations; 7) Lack of deep, honest relationships where feedback can be given and received; 8) Poverty, especially in the rural areas, where the pastor has virtually no pay, where the congregation wants him to support them (rather than vice versa) and the pastor is overwhelmed by his own needs and those of others. In the face of these big challenges ways forward proposed included: a) Continual reminders of the great Saviour God whom we serve, his charge to ‘preach the Word’, and the absolute necessity and power of faithful preaching of Christ crucified; b) Continual reminders of servant leadership – serving others and not ourselves; c) Fellowships like the EABEF where we can be encouraging one another, spurring one another on, supporting one another spiritually, emotionally and materially; d) The need to think of many rural pastoral placements as mission placements where the pastors are sent, supported and resourced as mission partners by urban churches; e) The need to keep the focus on the local church – fellowships and para-church organisations simply as encouragers of the local church. There is a great value in a multiplicity of teaching voices – where there is a great deal of theological consensus and unity in the gospel but at the same time some range of style, emphasis and perspective: a) because we don’t want to create clones of our own imperfect theology but rather provoke people to search the Scriptures for themselves; b) the plurality of elders (Titus 1:5); c) many counsellors (Prov. 11:14); d) avoiding guru status (Matt. 23:8). From Determine Dusabumuremyi: Before we come to the mechanics of sermon preparation and delivery there is a need for a deep heart work in the preacher. He needs to be awed by the ‘theatre’ in which he preaches – presence of God and coming of Christ (2 Tim 4:1) – and humbled by the greatness of the words and task with which he has been entrusted – words of eternal life to raise the dead. He needs to soak in the passage until he is personally convicted and formed by it; seeing himself as first and foremost a terrible sinner receiving glorious grace (Isaiah 6). And then he needs to feel the divine indignation at what is crippling the church (cf. Gal. 1:6; 3:1; 4:19-20; 2 Cor. 11:2). So perhaps there is another ‘C’ – Captured by the Word – that produces the 5 C’s. One of the big problems with the ‘hyper-grace’ movement (“Sin boldly”) is that there is no process of conviction and humbling. The exposition of Psalm 32 showed us not only the great, great joy of having our sins forgiven but also the way forgiveness is connected with a deep humbling in which I see the awfulness of my sin and feel the crushing weight and admit “I am a sinner” not in a bold, flippant way but in seriousness and sorrow, having been brought to the very end of myself, finding myself face down in a muck of my own creation, and then how the humbled, forgiven, beloved sinner is, as a result, a teachable, guidable disciple. The area of specific application to attitudes and behaviour (the imperatives of the message) is just as weighty as the area of gospel truths (the indicatives of the message) and requires just as much serious thought and preparation as the latter. Because the gospel is so weighty the application is weighty. Though there is danger in being too specific, often giving examples, telling stories and painting pictures of what this might look like in practice can be very helpful here. The focus of faith is the forward-looking confident hope and longing for the appearing of the crucified saving God-man (Titus 2:11-14; 1 Thess. 1:10). Our unity is around the gospel not around a particular method of text to sermon.